Vitamins & MineralsUniversal Nutrition Calcium Zinc Magnesium - 100 tabl. Universal Nutrition Calcium Zinc Magnesium - 100 tabl. The anabolic mineral formula - preparation supplementing the deficiencies of calcium, magnesium and zinc. One of the few supplements, which actually covers the daily demand for minerals. Universal Calcium - Zinc - Magnesium - when it comes to bone health, calcium alone is not enough. Our unique formulation contains 1000 mg of calcium per serving plus co-factors, such as copper, magnesium and zinc, which further influence the modulation of a number of metabolic processes. Calcium, zinc and magnesium belong to the micro and macro elements of our system. They are present in such small amounts that you would be tempted to say that they are not necessary for the proper functioning of the body. Nothing could be further from the truth. It is thanks to the elements that everything worked properly. Calcium is the precursor of many enzymatic chemical reactions. It is a key element in the process of muscle contraction, blood clotting, inflammatory processes and hormonal regulation. Also, he makes our bones at enormous mechanical stress on training retains all the properties of the motor. Included cofactors in the form of zinc (very helpful in spermatogenesis - increases sperm production), magnesium (regulates the osmotic pressure in the body) and copper (improves nervous system, a part of superoxide dismutase - a powerful antioxidant effectively combats free radicals) speak about the value of this supplement . Calcium and magnesium are known. mineral building blocks of the body. They are a key component of bones and teeth, are needed for the proper functioning of the heart and circulatory system and the functioning of muscles and nerves. Experience has shown that the ratio between calcium and magnesium should be 2: 1. Good preparations contain these two macronutrients, in such proportions. Demand for magnesium healthy person is approx. 300 mg per day. Magnesium is necessary for normal functioning of nerves and muscles. In the literature describes the case of 13-year-old boy who for 10 years suffered from epilepsy. At the same time he was in extreme depression, he showed delayed development, and the attacks of his illness were restrained chemical pills. When I started to give him magnesium, symptoms of epilepsy are gone. Serious symptoms of disease, and disease grand mal or petit mal (epilepsy), in each case, improvement can be obtained by adding magnesium to the daily food. It is worth remembering also calcium that epilepsy is very important and used in all calcium and magnesium in the ratio 1: 2. Epilepsy (epilepsy) so heavy that it must be controlled by medication requires the administration more magnesium and calcium, which are considered in the urine, "cast out" from the body by chemical drugs reassuring. We must therefore be administered through a lot of magnesium. Sometimes they have 500mg daily breaks all the symptoms of epilepsy. Magnesium is involved in directing the work 300 different enzymes and thus plays an important role in the metabolism of carbohydrates, fats, nucleic acids and proteins, and production processes and energy expenditure. According to some researchers, the appropriate dosage of magnesium improves the ability of the body's defense against infections, as well as improves intellectual abilities. Magnesium is required to maintain the balance of calcium, sodium, potassium and phosphorus in the body, ion exchange and absorption of vitamin C.
women: 300 mg of magnesium. pregnant women and breastfeeding: 450 mg of magnesium. women has used birth control pills, estrogen, hormones from 450mg of magnesium. men: 350 mg of magnesium. Athletes - from 450 mg of magnesium. 1 - not recommended to take a longer period of time of large doses of magnesium (more than 1,000 mg per day) without additional administration of calcium. 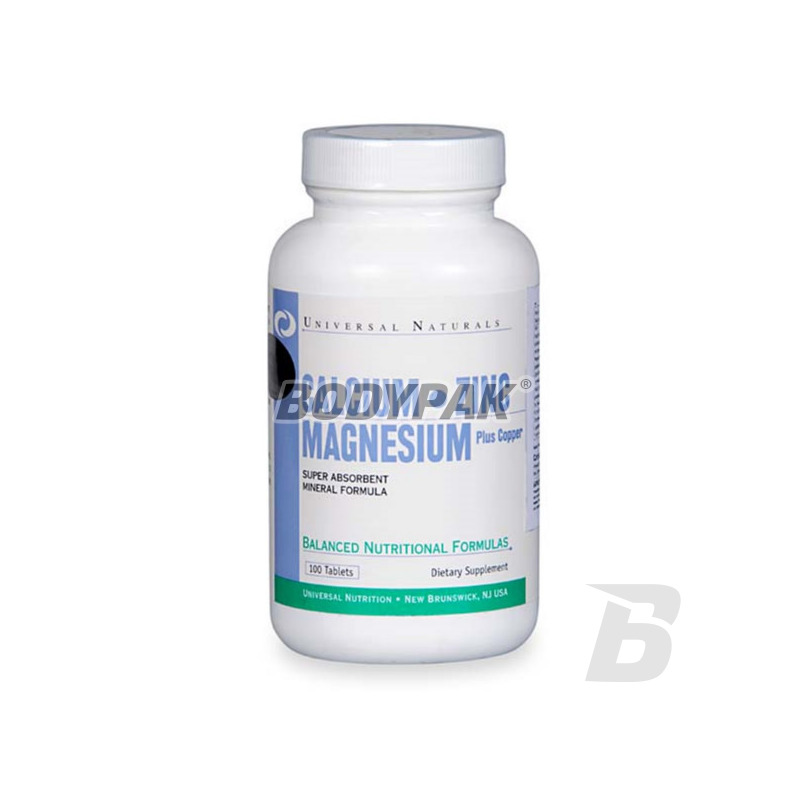 2 - Vitamin A, calcium and phosphorus increase the bioavailability and efficacy of magnesium. 3 - Magnesium also works well with B-group vitamins, especially B-6. 4 - Calcium and magnesium are best absorbed when the formulation which enjoy includes them in the form of a chelate, such as the product Magnesium Calcium Zinc from Universal. 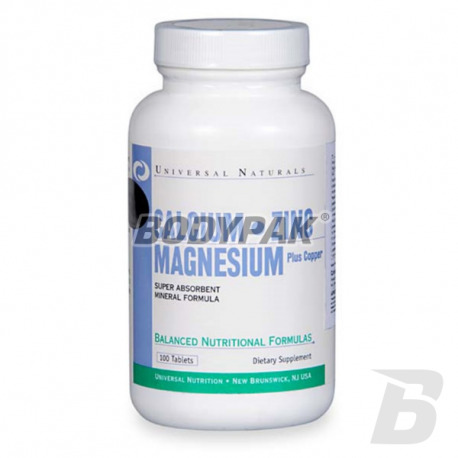 5 - Magnesium together with vitamin B-6 prevents the build-up of calcium stones in the urinary tract. 6 - Magnesium taken with food may hinder digestion, because neutralized gastric juices. So it is better to take it between meals. However, when hyperacidity taken on an empty stomach tablet of magnesium effectively neutralize gastric juices and alleviate discomfort. 7 - Persons receiving from heart disease, tablets containing magnesium, should agree with the doctor the dose of any other preparations of magnesium. The enemies of calcium include fat, oxalic acid (present eg. In chocolate) and phytic acid (found in cereal products) as well as medication type anticoagulants, steroids, corticosteroids, enkorton, sedative drugs, the funds available without a prescription and medications for heartburn and antibiotics. Table 2-3. before going to bed. Inne składniki: fosforan diwapnia, węglan wapnia, kwas stearynowy, celuloza mikrokrystaliczna, serwatka (z mleka), stearynian magnezu, farmaceutyczna glazura.